Spacious four bedroom family home situated in the charming village of Kirkpatrick Fleming only 8½ miles from Lockerbie and with access to motorway for commuting to Carlisle, Glasgow and Edinburgh. The property benefits from double glazing and LPG central heating, has a generous rear courtyard with outbuildings and is tastefully decorated. 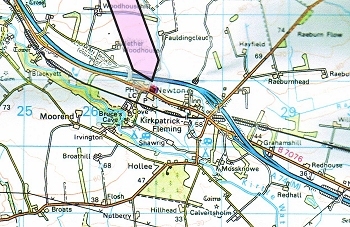 The village of Kirkpatrick Fleming has a primary school, village shop, petrol station and public house and there is a bus service to and from Lockerbie where there is a secondary school and further amenities. The property should be viewed to be fully appreciated. Accommodation comprises: - Ground Floor - Hall. Lounge. Dining Room. Kitchen. Utility Room. 2 Bedrooms (1 En-suite). Bathroom. First Floor - 2 Bedrooms. UPVC entrance door with glazed panel. Stairs to upper floor. Laminate floor. Radiator. South facing window overlooking front garden. Multifuel stove with tiled hearth and wooden mantel. Laminate floor. Radiator. South facing window overlooking front garden. Recess currently being used as an office. Built-in shelved storage cupboard. Cloakroom area. Laminate floor. Two radiators. Two north facing windows overlooking courtyard. A modern kitchen with a range of floor and wall units, ample work surfaces with tiled splashbacks and inset stainless steel sink and single drainer. Space for slot in electric oven and hob. Space and plumbing for washing machine and dishwasher. Tiled floor. Radiator. Glazed UPVC door to courtyard. Hatch to attic. Boiler. Tiled floor. South facing window. Door to walk-in wardrobe with light laid on. Radiator. 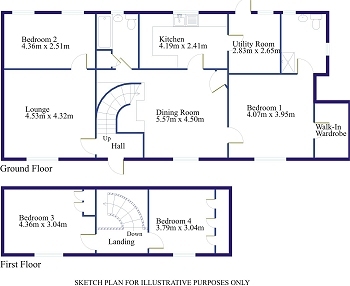 Fully tiled with four piece suite comprising shower cubicle with electric shower, wash hand basin, bidet and WC. Expelair. Electric heater and heated towel rail. Two north facing windows overlooking rear courtyard. Radiator. Fully tiled bathroom with three piece suite comprising bath with shower attachment, wash hand basin and WC. Hatch to attic. Radiator. South facing window. Fitted wardrobes. Access to eaves storage. Radiator. South facing window. Built-in wardrobes. Access to eaves storage. Radiator. There are four outbuildings combining garage and storerooms providing plentiful storage. The garage has an up-and-over garage door and has a rear window. The garden to the front is gravelled for ease of maintenance with a variety of shrubs and bushed. The garden to the rear has a vegetable plot, two apple trees, rhubarb and a planted border with a variety of shrubs and flowering plants for all year round interest. The courtyard is tarmac with parking for up to six cars, has an outside lap and backs onto an open field. From Dumfries take signs for the A780, and then join the A75 (signposted Carlisle). Turn right when you see the sign for Annan, Canonbie and Langholm. Turn right onto B6357 - Stapleton Road then at roundabout take the first exit onto the B7076, turn right onto Edengrove and arrive at Kirkpatrick Fleming. Drive passed the garage on your right hand side. The property is on your right opposite a red post box. Please see below map. The energy efficiency rating on the EPC is F.
Mains supplies of water and electricity. The property is connected to the mains drainage system. LPG central heating. Strictly by appointment only. Please contact the sellers on 07777 610 549 or the Selling Agents on 01387 257300. 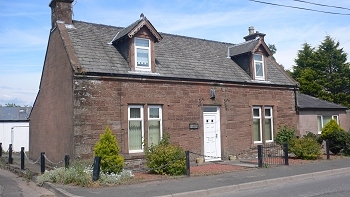 Offers in the region of £245,000.